Léon Payen, Paris; (Payen sale, Hôtel Drouot, Paris, 29 June 1916, no. 108); purchased by (Durand-Ruel, New York and Paris); sold 1919 to (Bernheim-Jeune, Paris). Lie, Norway. (Galerie Georges Petit, Paris); sold 9 June 1926 to Chester Dale [1883-1962], New York; bequest 1963 to NGA. Provenance according to copies of Chester Dale papers in NGA curatorial files. Exposition d'Oeuvres de Alfred Sisley, Galeries Georges Petit, Paris, 1917, no. 35, as Le Chemin sous bois. Dale, Maud. Before Manet to Modigliani from the Chester Dale Collection. New York, 1929: no. 40, repro. French Paintings from the Chester Dale Collection. National Gallery of Art, Washington, 1942: 57, repro. French Paintings from the Chester Dale Collection. National Gallery of Art, Washington, 1944: 57, repro. French Paintings from the Chester Dale Collection. National Gallery of Art, Washington, 1953: 67, repro. Daulte, Francois. 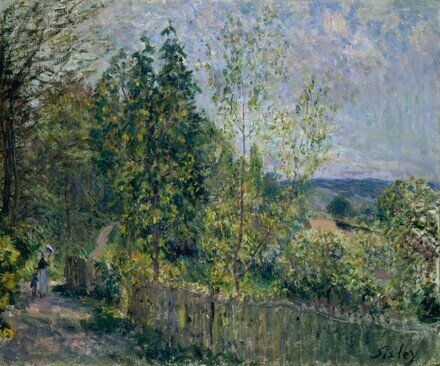 Alfred Sisley, catalogue raisonne de l'oeuvre peint. Lausanne: Editions Durand-Ruel, 1959. Eighteenth and Nineteenth Century Paintings & Sculpture of the French School in the Chester Dale Collection, National Gallery of Art, Washington, 1965: 102, repro. European Paintings and Sculpture, Illustrations. National Gallery of Art, Washington, 1968: 111, repro. European Paintings: An Illustrated Summary Catalogue. National Gallery of Art, Washington, 1975: 328, repro. Walker, John. National Gallery of Art, Washington. Rev. ed. New York, 1984: 511, no. 767, color repro. European Paintings: An Illustrated Catalogue. National Gallery of Art, Washington, 1985: 375, repro.